The Oroville Dam 2017 Spillway Incident – Possible Causes and Solutions | Climate Etc. On February 2017, Oroville Dam gained worldwide attention when its main spillway suddenly failed, seemingly without precedent, under natural operating conditions. While thankfully no casualties were caused by this incident, its direct and indirect effects will be felt in the local downstream communities in the years to come. Furthermore, even though the state was prepared to respond to the emergency, the fact that this event occurred with no prior warnings poses several questions on how to properly operate and inspect aging structures such as this one, and possibly highlights a larger problem the United States has with maintaining its large infrastructure. In order to better understand how the events of the February incident unfolded, it is first necessary to conduct a detailed analysis of Oroville Dam and the basic elements of its location, the Feather River Basin. 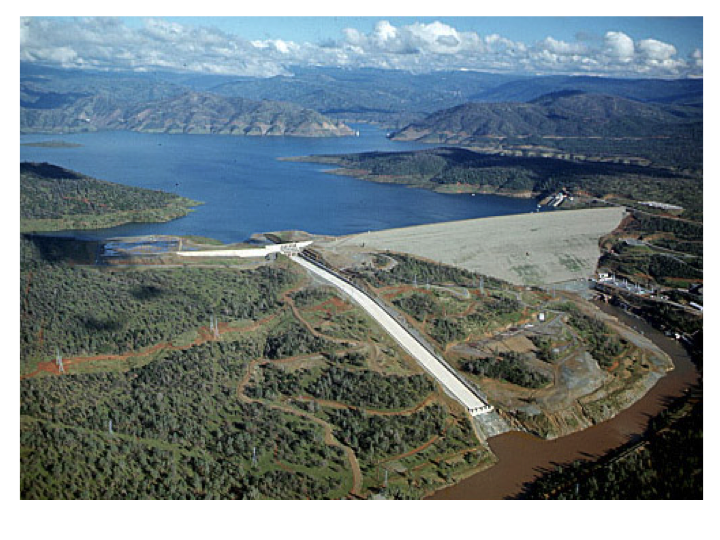 The Oroville Dam is a 234.7 m (770 ft.) tall earth-fill dam. Built in 1968, it is the tallest dam in the United States of America and the fifth tallest earth-fill dam in the world. It is located on the foothills of the Sierra Nevada, on the Feather River, in Butte County, California. (California Department of Water Resources, 2017). Directly below the dam, on the banks of the Feather River where it flows into the base of the Sacramento Valley, lies Oroville, a city of approximately 20 000 residents. An assessment of the hydroclimatic characteristics of the area (California Department of Water Resources, 2017) reveals it to have a Mediterranean climate, indicated by heavy precipitation during the winter months, producing floods during the spring, followed by almost completely dry summers. From a geological standpoint, the area near Oroville Dam contains metavolcanic rock, which is of adequate hardness, but it is also significantly weathered, especially near the ground surface. Based on the available recorded history (US Army Corps of Engineers, 1970); (Lamontagne, et al., 2012), the most intense flood events to ever occur in the Feather River basin were in 1986 and 1997. These were the result of rainstorms caused by a phenomenon called the “Pineapple Express”, which is a type of atmospheric river, meaning a relatively narrow stream of enhanced water vapor. The main characteristics of this weather pattern are an intense, persistent flow of atmospheric moisture (US Geological Survey, 2010). Flood inflow peaks for 1986 and 1997 were 7,545 m3/s (264,500 cfs) and 7,766 m3/s (274,267 cfs) respectively (California Department of Water Resources, 1986); (California Department of Water Resources, 2017). Oroville Dam is a zoned earth-fill embankment structure with a maximum height of 235 m (770 ft.) above streambed excavation. The embankment itself has a volume of approximately 61 million m3 (80 million cubic yards) and is comprised of an inclined impervious core atop a concrete foundation, supplemented by zoned earth-fill sections on both sides. Figure 2. Aerial view of Oroville Dam. Source: California Department of Water Resources (2008). Pertinent data related to Oroville Dam and related facilities can be found in Figure 3 below and in the Appendix in Table A-1. (California Deparment of Water Resources, 1974); (California Department of Water Resources, 2017). In the interest of brevity, only the main and emergency spillways are analyzed further in this article, as they are of critical importance. Detailed information for Oroville Dam’s other facilities can be found in (Koskinas, 2017) and any references therein. Oroville Dam’s spillway, located on the right abutment of the main dam, is comprised of two independent elements: a gated flood control outlet and an uncontrolled emergency spillway. The former consists of an unlined approach channel, a gated headworks, and a lined chute approximately 930 m (3050 ft.) in length, extending down to the Feather River. The latter is an ungated concrete ogee weir with the crest set at elevation 274.62 m (901 ft.), just one foot above maximum storage level (elevation 274.32 m or 900 ft.). The area below the emergency spillway is not lined with concrete, meaning that when it is put to use, flow will spill over natural terrain. Figure 5. February 10th, 2017. Workers prepare the emergency spillway for use by placing large rocks at its foot. Source: Brian Baer, DWR. The grout curtain of the dam’s main embankment continues under the emergency weir’s left reach, and drains are used under the downstream half. The crest of this weir on the right side rises only one foot (0.30 m) above the excavated channel, yet is keyed 2 feet (0.60 m) into the foundation (California Deparment of Water Resources, 1974). The combined capacity of the main and emergency spillways is 17,472 m3/s (624,000 cfs), which corresponds to a peak inflow of 20,160 m3/s (720,000 cfs). The event that would cause this inflow is named the Probable Maximum Flood, or PMF (US Bureau of Reclamation, 1965); (California Deparment of Water Resources, 1974). This section contains significant findings from a review of Oroville Dam’s design documents and subsequent inspection reports, which provide possible clues for the causes of the 2017 incident. For the sake of brevity, only the findings directly related to the dam’s main and emergency spillways are mentioned in this article. First, the main spillway chute’s initial drain system plan ended up being significantly altered during construction. After a recommendation by the Oroville Dam Consulting Board, the original 100 mm (4-inch) diameter horizontal pipe drains under the chute were enlarged to a 150 mm (6-inch) diameter, placed in a herring-bone pattern. (California Deparment of Water Resources, 1974). Next, Oroville Dam is inspected at least on an annual basis by the California Department of Water Resources Dam Safety Division, and every five years the Federal Energy Regulatory Commission (FERC) conducts an independent inspection. Unfortunately, the FERC inspection reports are heavily redacted, because they contain information classified as “Critical Energy/Electric Infrastructure Information” (Federal Energy Regulatory Commission, 2014). While this measure can be appreciated as an extreme precaution with the safety of the population in mind, in order to avoid possible terrorist attacks on critical engineering structures in the United States, the concept of withholding data from the public is wholly inconsistent with the basic foundations of science and engineering, which are based on peer review. At the very least, some explanatory data should be provided next to every redaction, to give clues as to what specific element is being redacted and why. During the first few days of January 2017, two precipitation events occurred just over Lake Oroville (California Department of Water Resources, 2017); (Koskinas, 2017). These storms quickly led into a large increase of inflows into Lake Oroville, shown below together with corresponding outflows, on an hourly scale. Figure 7. 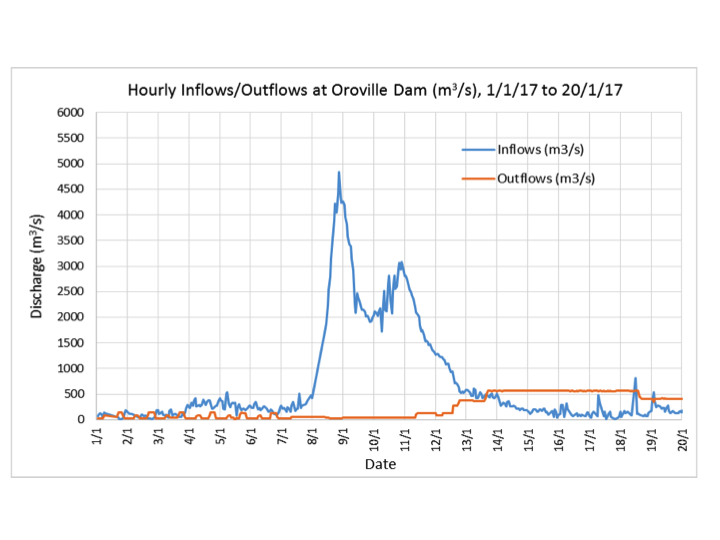 Hourly Inflows and Outflows at Oroville Dam in m3/s, from January 1, 2017 to January 20. Two inflow peaks occurred according to the graph, the primary one was 4,839 m3/s (170,887 cfs) on January 8 at 21:00 PM, and a secondary peak of 3,079 m3/s (108,734 cfs), occurring on January 10 at 22:00 PM. These inflows are definitely significant, yet expected during a typical wet season. However, outflows from Lake Oroville at the same time were very low, almost zero. This resulted in a sharp water storage increase in Lake Oroville, as well as a significant rise in its surface elevation. Lake Oroville’s surface elevation initially exceeded the flood control minimum on January 12, 2017 at 17:00 PM. Around that time, outflows from Oroville Dam’s main spillway were increased, to compensate for this fact and return the surface elevation to below the minimum. Overall, the Oroville Dam operator was able to return the surface level to below the flood control limit on February 3, 2017 at 17:00 PM, just in time for an upcoming February rain storm. According to the CDEC database, a rain storm over the Feather Basin began on February 2, 2017, and ended around February 11. Inflow for the whole month of February 2017 is plotted in the graph below. Figure 8. 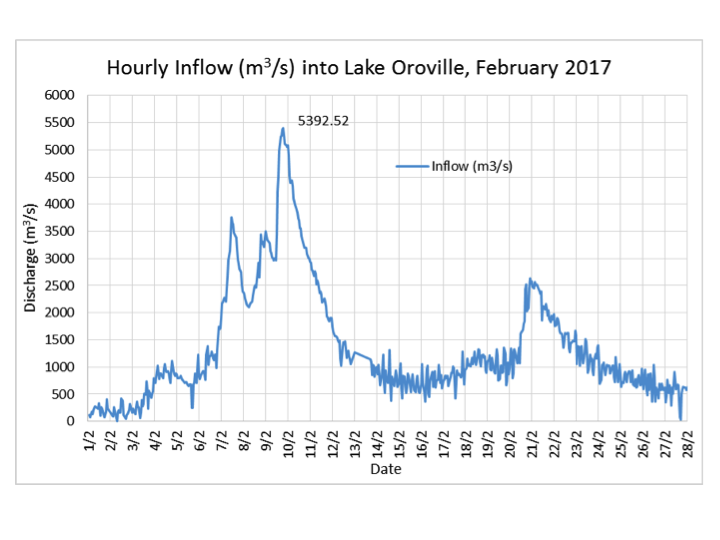 Hourly inflow into Lake Oroville in m3/s, for the month of February 2017. Overall, the early February rain storms seem to have resulted in subsequent inflows with peaks occurring shortly after peaks in the corresponding upstream precipitation measurement stations. The largest measurement occurred on February 9 at 19:00 PM, and was 5,392 m3/s (190,435 cfs). This value is significantly lower than the highest recorded floods to ever occur in the Feather Basin, including the 1986 and 1997 floods. Under normal circumstances, Oroville Dam should have been able to deal with this event without trouble. On February 6 at approximately 13:00 PM, outflows from Lake Oroville were raised in order to prepare for incoming inflows to 1,500 m3/s (54,000 cfs). 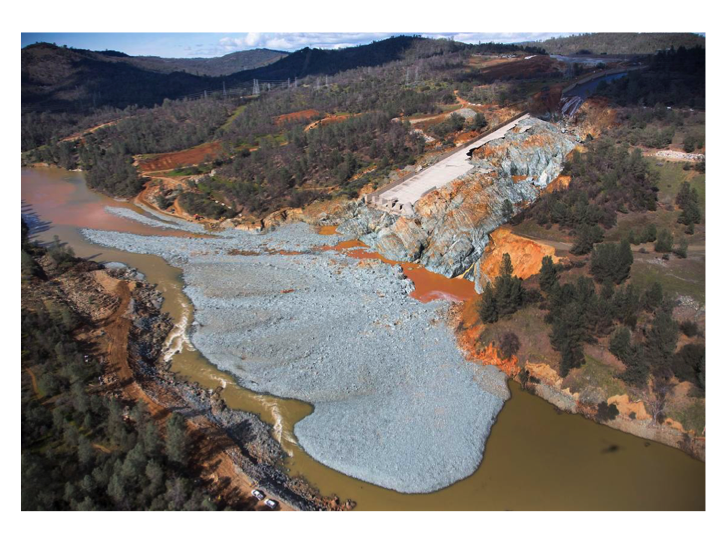 However, the next day, February 7, at approximately 10:00 AM, workers at the Oroville Dam site noticed a discoloration in the water flowing through the main spillway. In order to detect the source of this phenomenon, outflows from the main spillway were immediately halted, revealing a large hole in the main spillway chute. Figure 10. February 7th, 2017. Front view of the initial main spillway chute damage. Source: Kelly M. Grow, DWR. At this point, the main spillway is already severely damaged, and any discharges at that point would rapidly amplify this erosion and move entire parts of the concrete chute and walls downstream. However, Lake Oroville’s surface elevation is already past the flood control minimum, and inflows from the February rain storm are imminent. After brief consultation with various dam safety agencies, the operators decided to release test flows into the main spillway and monitor the damage. These small flows ranged hourly from around 300 m3/s to 900 m3/s (10,000 to 30,000 cfs) over the course of February 8th. On the very next day, February 9, the hole in the main spillway had increased in size, seen below compared to the initial February 7 picture. Figure 12. Comparison of the February 7 main spillway hole (left) to the damage on February 9 (right). The erosion appears to be moving uphill. Sources: Kelly M. Grow, DWR and the Metabunk.org forum. 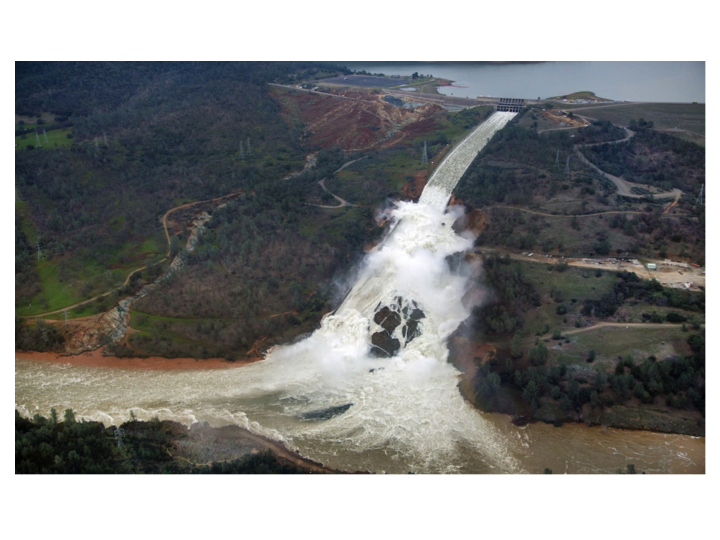 At this point the Oroville Dam operators were facing a tough dilemma; either continue to release flows through the already damaged chute and cause further erosion, or risk using the untested auxiliary spillway. However, as the latter structure is ungated, if unchecked the dam itself would make that choice for them, as water would flow over the emergency spillway as soon as the surface elevation surpassed its crest, at 274.62 m (901 ft.). As such, a plan was formulated to continue letting small flows pass through the main spillway, while also preparing the area around the auxiliary spillway in case it would have to be put to use. To that end, workers began clearing the area downstream of this secondary structure, as well as placing large rocks at its foot to mitigate possible erosion (See Figure 5). At this point, the inflows into Lake Oroville increased tremendously, reaching the aforementioned peak of 5,392 m3/s (190,435 cfs). On February 11, at 8:00 AM, surface elevation at Lake Oroville surpassed that of the emergency spillway crest, meaning that for the first time in the dam’s history, water would pour over it. According to data from CDEC (California Department of Water Resources, 2017), water poured over this ogee weir for just over 37 hours in total, as the surface level dropped below its crest elevation again on February 12 at 21:00 PM. Unfortunately, erosion downstream developed much more rapidly than anticipated. While the emergency spillway was only active for a very brief duration, and peak discharge did not exceed 400 m3/s (15,000 cfs), large boils occurred downstream, destroying the access road below and threatening to damage the spillway crest itself by failure due to headcutting. The exact extent of the damage was not clearly visible when water was still pouring over the downstream hill on February 12, however, and thus local authorities, fearing the worst outcome, were forced to spring into action and order the evacuation of Oroville and other areas downstream of the dam, including Yuba City and Marysville. More than 180,000 people in total live in this area, and thus this evacuation order made the Oroville Dam spillway incident headline news worldwide (BBC, 2017). The California Department of Water Resources responded to the evacuation order by immediately increasing outflow releases from the main spillway to 2,830 m3/s (100,000 cfs). This would drastically lower the surface elevation and stop flows over the emergency spillway and any resulting erosions there, at the cost of causing irreparable damages to the main spillway. Figure 16. February 27th, 2017. Aerial view of the Oroville Dam main spillway. Large sections have eroded away and ended up in the Feather River as debris. Source: Dale Kolke, DWR. Shortly after these events, a large scale effort began with the purpose of quickly clearing debris from around the spillway and working on repairing it. After a contractor was selected for the repair project, work on the main spillway chute began immediately. Estimated cost for the project is at around $500 million, and is almost complete as of November 30th (Schnoover, 2017); (Cooper, 2017). 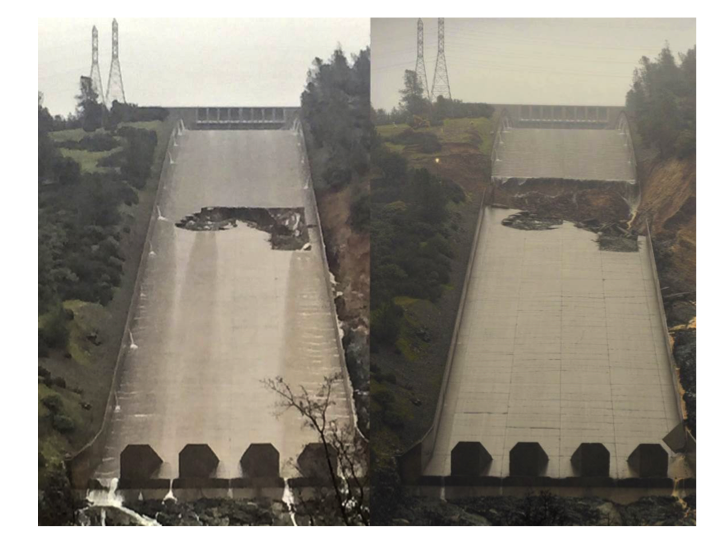 When examining the causes of a real event such as the Oroville Dam spillway incident, lacking the ability to perform an on-site forensic investigation, it is tempting to simply look at photographs of damaged structures, and attempt to gather clues directly from them. However, this is less of a scientific approach and more that of a typical conspiracy theorist. To avoid jumping to unfounded conclusions, it is of the utmost importance to follow the steps of a proper scientific method: formulating a question, doing background research, testing with experiments (or models) and troubleshooting their results. Based on the evidence already gathered, it is possible to make several hypotheses for the possible causes of failure for both spillways. It is much easier to determine the cause of the near failure of the emergency spillway due to the fact that it was actuated for a very brief duration under constant supervision, as authorities were already alerted of the situation. While water was pouring over the concrete weir without a problem, it was the surrounding conditions that posed a threat. While it is known that this concrete overpour weir was built on a solid foundation, no effort was made to secure that the downstream ridge would be able to accommodate flows passing over it without significant erosion occurring as a result. This could have been acceptable if this structure was truly used as an emergency measure (i.e. any outflows from it not being factored into hydrologic design calculations, using only the main structure’s design capacity instead), but this is not the case. In fact, under current design specifications (US Army Corps of Engineers, 1970); (California Deparment of Water Resources, 1974) it is expected to reach outflow discharges of around 10,000 m3/s (350,000 cfs). Seeing as erosion threatened to cause structural failure at less than 420 m3/s (15,000 cfs), the spillway’s ability to withstand PMF-level discharges is questionable. 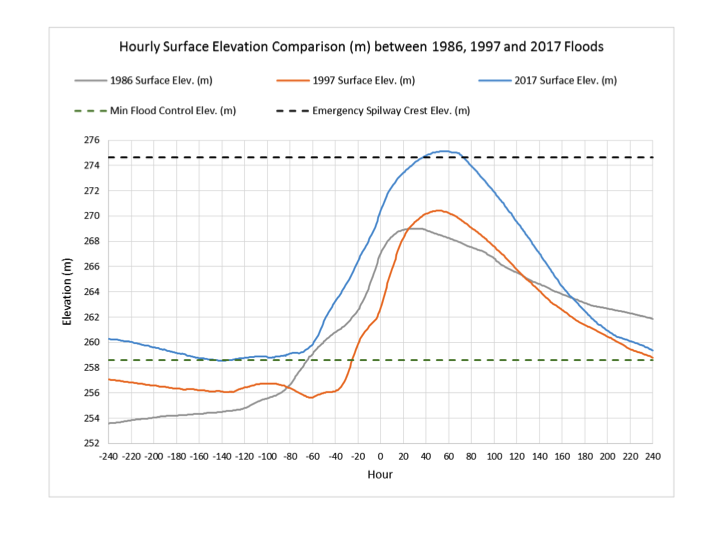 When posing the question of why Oroville Dam was capable of withstanding the previous floods of 1986 and 1997, and not the 2017 event, one is prompted to also examine the surface elevation levels prior to each flood. An attempt is made to compare Oroville Dam reservoir surface levels shortly before and after each of the three recent flood events, occurring in 1986, 1997, and 2017. In the graph below, the y axis represents surface elevation in meters, whereas the x axis represents up to 240 hours (10 days) before and after peak inflow. Hour 0 is the hour during which peak inflow occurred for each event. Figure 17. Hourly comparison of Oroville Dam reservoir surface elevations 10 days before and after the peak inflow of the 1986, 1997, and 2017 flood events. Notably, while the 2017 peak inflow is the lowest of the three major flood events, its surface elevations are the highest. This is due to two factors. First, as is clear from the graph, shortly prior to peak inflow, surface elevation during 2017 was higher than that of previous floods. Already, this has a negative impact on flood management. While this elevation is below the minimum limit specified by the flood control manual (US Army Corps of Engineers, 1970), the 2017 flood is actually harder to manage than that previous events. This is partly why despite it not being a record flood, this event came close to causing severe damages to Oroville Dam’s key structures once the main spillway failed. Attempting to detect what caused the initial failure of the main spillway is a much more complicated task, as due to the nature of the incident, very few pictures are available showing the initial chute hole that was spotted on February 7th. Any physical evidence that could have been gathered from the scene at the time has been likely washed away from the subsequent discharges that eroded away the bottom half of the chute and much of the downstream ridge. As was mentioned earlier, simply looking at pictures of the February 7th chute damage is not enough, and can lead to forming unbased conclusions. Thus, further background research is required. First, a simple mathematical model of the main spillway chute is constructed, using an iterative procedure to simulate 1-D steady flow for various discharge levels, known as the standard step method (US Army Corps of Engineers, 2016). An example is given below, with an additional data label at the exact point where the 2017 hole occurred. However, no surface flow irregularities are immediately apparent from this analysis, indicating that cavitation is probably not the initial cause of the of main spillway’s failure. On February 6th, shortly before the spillway failed, it was operating with a discharge of approximately 1,416 m3/s (50,000 cfs). Under these conditions, estimated velocity at the failure point is 23 m/s (77 fps), or 84 km/h. This explains the intense force of the water flow; once the initial hole was opened in the spillway, the stream was easily able to erode away large sections of the chute and the downstream ridge. 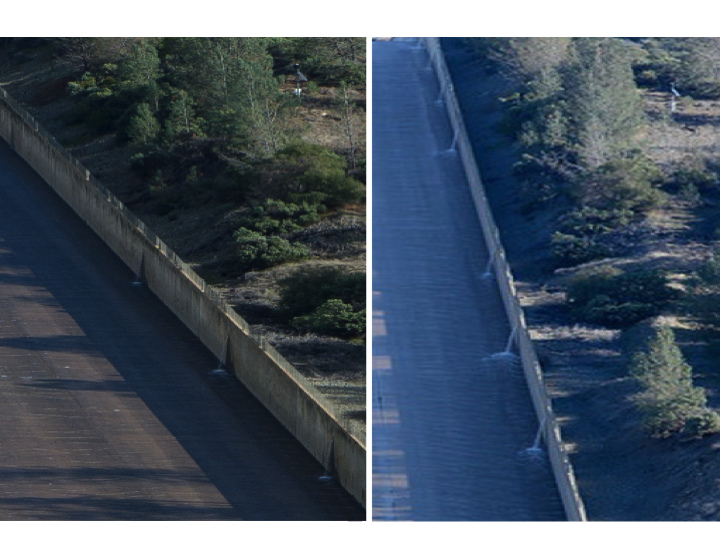 Below is a comparison of two pictures of the main spillway chute, taken shortly before the February incident. The first was taken on January 11th, 2017 and the second on January 27th of the same year. Image 38. Views of the Oroville Dam main spillway chute. Left photo taken January 11th, 2017, and right photo taken January 27th, 2017. A red arrow points to the location of the initial chute failure. Sources: Kelly M. Grow, DWR and Bill Husa, Chico Enterprise-Record. While these pictures were only taken within 16 days of each other, there are significant differences in the spillway chute. A central section of the chute’s concrete floor appears dry on the right-hand picture, despite flows passing over the rest of the structure. This indicates possible irregularities among the floor slabs. Furthermore, the fact that this dry patch is not visible in the photo taken earlier, could possibly mean that a possible slab uplift occurred near the red arrow’s location, diverting small water flows around it instead of over it. In addition, below is a side by side comparison of the same pictures, but zoomed in to better show the drains on the chute’s left wall. Figure 19. Side by side comparison of drains in the spillway chute’s left wall, left photo taken January 11, 2017 and right photo taken January 27, 2017. Sources: Kelly M. Grow, DWR and Bill Husa, Chico Enterprise-Record. 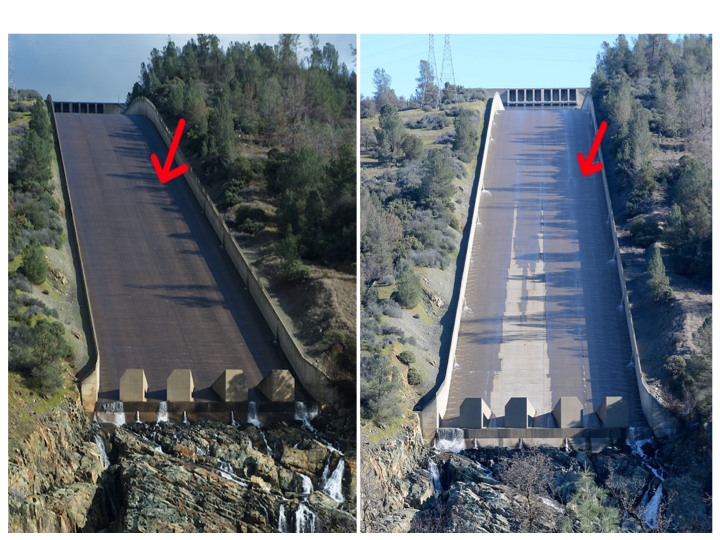 This comparison reveals two clues: Firstly, water is coming out of the drains under pressure, which is not according to design specifications, and secondly, discharge from these drains significantly increased in a short time, once flows from the January flood filled up the Oroville Dam reservoir. This is a telltale sign of a buildup of excess water occurring beneath the spillway, which could apply significant forces to the concrete slabs from below and cause them to uplift (Morrison-Knudsen Engineers, Inc., 1986). Additionally, the January 27 photograph shows the drains on the opposite wall operating under pressure as well. Geology immediately in and around Lake Oroville is comprised mostly of what is called the “Bedrock Series”. This consists mostly of metavolcanic and pyroclastic rock, such as amphibolite. Above this bedrock lie various younger sedimentary rocks such as shales, dolomites, etc (Koczot, Jeton, McGurk, & Dettinger, 2005); (Jennings, Strand, & Rogers, 1977); (Freeze & Cherry, 1979). Blasting was used for almost 90% of the chute foundation, in order to reach grade. The remaining amount consisted of the removal of several seams of clay located in the foundation, and a few areas where the slope failed (California Deparment of Water Resources, 1974). The slopes in the flood control outlet section were of a lower quality rock than initially presumed, and several large seams ran parallel with the main spillway chute. The countermeasure that was applied was the replacement of planned anchor bars with grouted rock blots, pigtail anchors, and chain-link covering of the area’s surface (California Deparment of Water Resources, 1974). The fact that the main spillway chute was built atop rock that required blasting to excavate would mean that it is suitably hard to serve as foundation for the concrete chute sections. However, pictures of the initial spillway failure reveal more information about this foundation rock. Figure 20. February 7th, 2017. Side view of the initial spillway chute failure. Source: Kelly M. Grow, DWR. Based on this photograph, it appears that the foundation rock is indeed comprised of the metavolcanic materials mentioned previously. However, this particular section of bedrock appears highly fractured and heterogeneous. There is a significant variance of color in the formations, indicating different degrees of weathering. Furthermore, due to the orientation of the seams, the rock is expected to erode away in large chunks, not in sheets. It is also possible that water was able to seep through cracks in the weaker, more weathered sections of rock and undermine the chute from below. Until now, known flood control studies for Oroville Dam and the Feather Basin have attempted to determine the Probable Maximum Flood (PMF) for Lake Oroville, based on the Probable Maximum Precipitation (PMP). All dams which are considered high-risk structures like Oroville Dam must be designed to withstand the PMF (US Bureau of Reclamation, 1965); (US Army Corps of Engineers, 1970); (California Department of Water Resources, 2017). However, the PMP-PMF analysis has several flaws. From a theoretical standpoint, the PMP suggests that there exists a theoretical upper limit of precipitation, which is simply not true (Koutsoyiannis, 1999). Nature is not bounded by numerical constraints, and the study of a brief history of available data cannot generate a true possible maximum value of precipitation. Besides the semantics, the actual calculation procedure for the PMP and resulting PMF tends to make several unclear assumptions and generalizations. The most recent existing study available detailing PMP calculations in California is Hydrometeorological Report No. 59 or HMR 59 (US Army Corps of Engineers, 1999). In brief, the computational procedure includes tracing an outline of the drainage basin, placing this outline on top of a given PMP 10-mi2, 24-hour index map, then determining depth duration relations and areal reduction factors, and finally conducting temporal distribution of incremental depths extracted from a given curve. While this method is simple to use, and the analysis involved in creating these PMP index maps undoubtedly contains valuable information, it would better to instead adopt a probabilistic approach to precipitation analysis, where instead of assuming a deterministic, theoretical upper limit, studying existing precipitation data and extracting a return period for the already calculated 24-hour index depths, for every sub-area of the Feather River Basin, as determined by the California Department of Water Resources in (DWR, 2004). In accordance with (Koutsoyiannis, 1999); (Papalexiou & Koutsoyiannis, 2006); (Papalexiou & Koutsoyiannis, 2013), the GEV distribution using the method of L-moments is fitted to annual daily maxima of precipitation data gathered from the Feather Basin (Menne, et al., 2015); (California Department of Water Resources, 2017). A map of analyzed stations, as well as a distribution fit example can be found in the Appendix (Table A-2; Figure A-1). After consulting the 24-hour PMP index depth maps in (US Army Corps of Engineers, 1999), and comparing them to those specified in (DWR, 2004) for the subareas of the Feather River Basin, it is possible to use these distribution fits to estimate the annual daily maximum precipitation value with a 10,000 year recurrence interval, and find the return period of the stated probable maximum precipitation index depths. Below is a table summarizing the results of this analysis. Table 2. 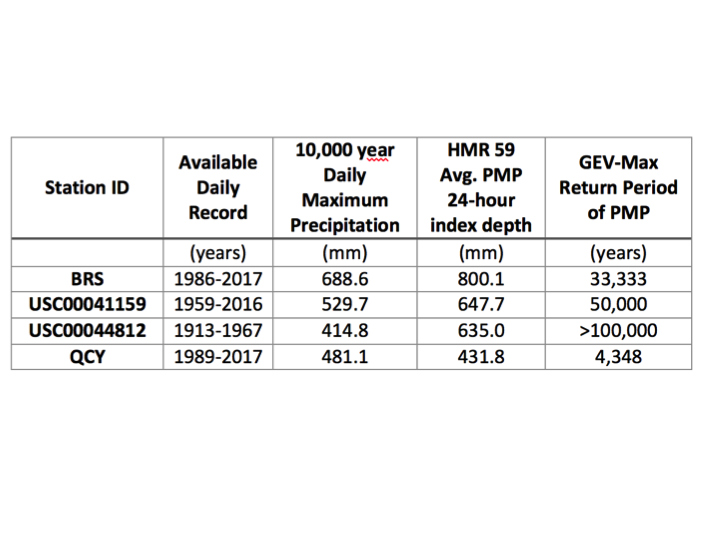 10,000-year recurrence interval annual daily maximum precipitation forecasts, compared to the 24-hour PMP index depths and their recurrence intervals, based on the GEV-Max distribution fit. As is evident from the analysis, the PMP usually has a recurrence value that is abnormally high, which while increases safety, does tend to go beyond engineering design practices. Extreme care must also be taken to not assume that designing with the PMP method removes risk entirely simply because it generates large values. For instance, in the case of the Quincy (QCY) station, the PMP 24-hour index depth has a corresponding return period of 4,348 years, which is still very high, yet leads to the conclusion that the PMP method is not always as risk-free as some would expect. The concept of the Probable Maximum Flood is also highly controversial, for much of the same reasons as the PMP. Even the PMF is the product of a probabilistic method, and designing with it in mind always will have a certain degree of risk, however small. It is difficult to generate a true design flood for Oroville Dam without taking multiple factors into account, but it is possible to assign a return period to existing design floods by using the already familiar flood frequency analysis method. A record of unregulated, annual maximum flow data for the Feather River at Oroville station resulting from rainfall for a 1-day duration provided by (Lamontagne, et al., 2012) is an ideal input time series for this purpose, and further cross-examination with known extreme floods such as the 1964, 1986, and 1997 events confirms its accuracy. Two distributions are fitted to the data, namely the Log-Pearson III with the method of maximum likelihood estimators and the GEV distribution using the L-Moments method, according to (Interagency Advisory Committee on Water Data, 1982); (Seckin, Haktanir, & Yurtal, 2011); (Papalexiou, Koutsoyiannis, & Makropoulos, 2013). The distribution fits can be found in the Appendix (Figure A-3, Figure A-4). From this analysis, it is possible to extract the 10,000 year floods for each of the distribution fits. For the Log-Pearson III fit, the 10,000 year flood is estimated to be 32,000 m3/s (1,129,000 cfs) and for the GEV fit, the same value is 24,464 m3/s (864,000 cfs). Furthermore, recurrence intervals can be assigned to existing calculated inflows such as the Standard Project Flood and various PMFs that can be found in (California Deparment of Water Resources, 1974); (US Army Corps of Engineers, 1970); (DWR, 2004). Table 3. Return periods in years for various floods, as generated by the distribution fitting process. The Standard Project Flood is mentioned to have a recurrence interval of 450 years (California Deparment of Water Resources, 1974), which is close to the average of the two distribution fitting results. However, the return period of the probable maximum flood is supposed to exceed 10,000 years, yet only the 1983 PMF achieved this for both distribution fits. Notably, the most current PMF was calculated in 2003 based on HMR 59 (Interagency Advisory Committee on Water Data, 1982); (California Department of Water Resources, 2017), and its recurrence interval does not exceed 5,000 years for both distributions. 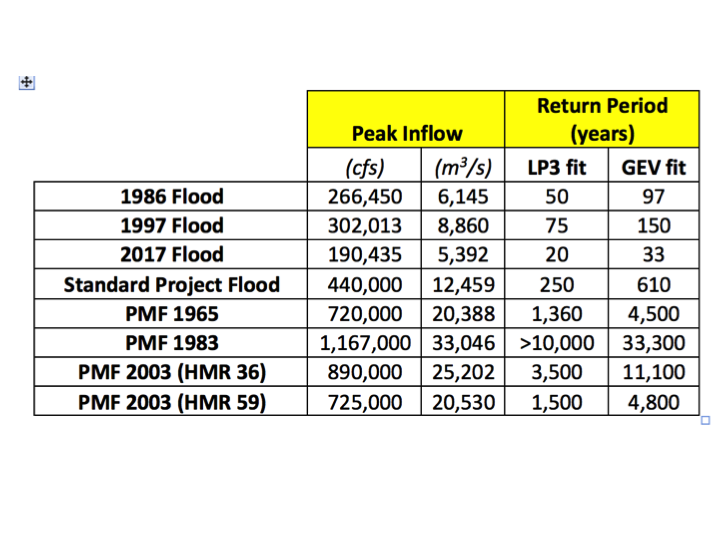 Furthermore, according to this analysis, the return period of the 2017 flood is only 20 years for the LP3 fit, and 33 years for the GEV fit. One of the main reasons the February 2017 storm had such a devastating impact on Oroville Dam was the fact that reservoir surface elevations were higher than those of previous significant flood events. While levels were within the flood control manual standards (US Army Corps of Engineers, 1970), the fact that they were close to the limit made dealing with the February 2017 inflows a much more daunting task once the main spillway failed. Thus, it would seem reasonable to request a lowering of the minimum flood control elevation level for Lake Oroville. However, this is not as simple as it sounds. 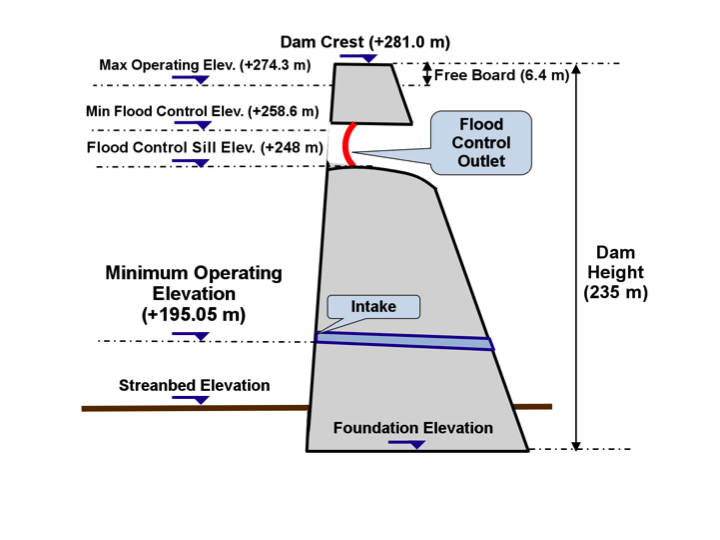 It is not feasible to request an arbitrary minimum flood control elevation level because it is bound by physical constraints; namely, the flood control outlet sill elevation is at 248 m (813.6 ft.). While outflows can also be routed through the river valve outlet and Hyatt Powerplant tailrace channels, they can output only a fraction of the spillway’s discharges. Aside from that, Oroville Dam is not only designed to stop floods; it has a number of other uses that make its ability to store water paramount to the sustainability of the Feather Basin and its downstream areas. It would be a terrible mistake to request a significant lowering of the flood control elevation without first taking into account economic and ecological factors together with flood risk management. Furthermore, since Oroville Dam’s main spillway is being rebuilt, it makes sense to make as much use of this new structure as possible. The Oroville Dam 2017 spillway incident will be remembered in history for its uniqueness, as it is a failure of a dam’s key structure that occurred under standard operating conditions, yet at an unfortunate time. It makes for a very interesting problem from a dam operator’s perspective; what does one do when a spillway, a structure built to deal for emergency situations, fails just when it is needed? And in the specific case of Oroville Dam, is the auxiliary spillway a feature, or a mark of a critical flaw in its design? While it would indeed save the main dam from overtopping in the event of a probable maximum flood, in doing so it would likely not be able to hold for long, failing and releasing 10 m (30 ft.) of the reservoir’s water downstream, flooding an enormous area with more than 180,000 permanent residents. Furthermore, this aforementioned probable maximum flood seems more probable then presumed, and it’s definitely not a maximum. An independent forensic team tasked with determining the causes of the spillway incident recently published a summary of their findings (Oroville Dam Spillway Incident Independent Forensic Team, 2017). With the ability to conduct an on-site investigation, they were able to confirm some of the causes mentioned in this study as well as outline new ones. Namely, the redesign of chute’s underdrain system apparently led to an inconsistent thickness in the concrete floor slabs, which resulted in cracks above the herringbone drains, allowing water to pass through the slabs and also potentially led to concrete spalling. Furthermore, the anchorage of the concrete to the foundation was in some places developed in weathered sections of rock, leading to a pullout strength lower than the intended design. 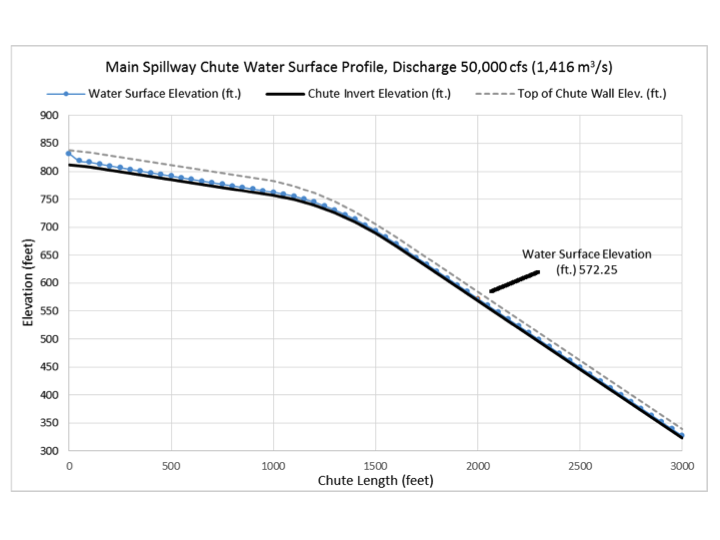 From a structural standpoint, the main spillway chute appears to have initially failed due to uplift of its concrete floor slabs, caused somewhere between Stations +33 00 and +33 50 (2,000 and 2,050 feet of its rectangular section length, respectively). This uplift appears to have been caused by water accumulating below the chute floor, which was unable to be routed through the underdrains. This evidenced by photographs showing them operating under pressure, which should never occur under design specifications. The rest of the damage to the main spillway was caused by high velocity flows due to the large amount of water that had to be routed through it to avoid erosion downstream of the emergency spillway. The fact that Lake Oroville’s surface elevation was at the minimum flood control level, above that during previous major flood events, resulted in more severe conditions, even though the February 2017 inflows were not record-high. Thus, a lowering of the minimum flood control level to 255 m (837 ft.) is recommended. (Friends of the River; Sierra Club; South Yuba River Citizens League, 2006) reveal that this actually would not be a new requirement, but an adaptation to outdated assumptions made in the 1970 flood control manual (US Army Corps of Engineers, 1970). Based on the main spillway rating curve (US Bureau of Reclamation, 1965), it would be feasible to maintain the dam reservoir at this level during wet seasons. The current PMF for Lake Oroville has a return period of less than 10,000 years based on the above analysis. It is recommended to either calculate a new 10,000 year flood for Lake Oroville using a probabilistic method, or use the 1983 PMF which is suitably large. However, the state must assign a recurrence interval to any resulting flood, as the term “probable maximum flood” is outdated (Koutsoyiannis, 1999). The California Department of Water Resources’ quick response to the incident and initiation of a full scale repair and reconstruction of the Oroville Dam spillways is greatly appreciated. However, under current design, the dam is only capable of withstanding the Standard Project Flood with a return period of 500 years without sustaining significant damage. The emergency spillway should be immediately redesigned to be fully armored with concrete in order to withstand a flood with a recurrence interval of 10,000 years without causing significant erosions to the downstream areas. This has been repeatedly requested by local interest groups (Friends of the River; Sierra Club; South Yuba River Citizens League, 2006) (Schnoover, 2017). In the United States, many are using this incident as a textbook example of severe issues the country has with maintaining the gigantic number of high-risk structures it has built over the past century (BBC, 2017); (Stork, et al., 2017). Indeed, Oroville Dam itself has reached the halfway point of its expected life as a structure. Until a major problem occurs at a critical facility like this one, it is easy to get complacent and avoid or postpone critical maintenance procedures like routine inspections and small repairs. And even when larger problems or design flaws are pointed out (Friends of the River; Sierra Club; South Yuba River Citizens League, 2006), it is difficult to convince the authorities to fund large-scale repair projects. However, one would argue that such repair projects actually conserve money in the long run. The new Oroville Dam spillway is estimated to cost around $500 million (Rogers, 2017) which is significantly more than what would have been required for a full concrete armoring of the emergency spillway back in 2006. And this is without taking into account the lives and properties of the downstream community, who deserve to live in safety. After the incident, the California Department of Water Resources seems to have taken a different stand on the issue, being more open to suggestions about the construction of the new spillways (California Department of Water Resources, 2017). Still, this response has comes at a rather late time, and is being met with some criticism (Schnoover, 2017); (Stork, et al., 2017). However, their stance on providing free access data to the public, and attempting to communicate and cooperate with local residents and interest groups is, while not exemplary, definitely a step in the right direction. If there is a lesson that must be learned from this incident, it is that even when a critical, yet aging structure like Oroville Dam seems to operate up to standard, one small flaw can emerge at any time and result in a severe failure due to the sheer scale of the facilities and the conditions they are expected to consistently work under. While routine official inspections by the dam operators and independent authorities are a necessity, they are simply not enough as time goes by. Informal inspections of all related facilities must be conducted by dam operators on a weekly or bi-weekly basis, in accordance with existing guidelines (Morrison-Knudsen Engineers, Inc., 1986), not with the intent of writing official reports, but simply to detect the telltale signs of imminent failure before the theoretical worst outcome becomes a reality. If the dam operators had noticed the differences in the main spillway chute’s floor slabs between mid and late January they might have been able to repair it in time and avoid the incident from occurring entirely, or at least mitigate its results. On-site physical inspections aren’t the only available method for detecting faults, however; using currently available technology, it is possible to install monitoring systems using high-definition cameras and aerial drones. These could be controlled remotely from a control room, providing easy visual access to critical dam facilities. Furthermore, this incident shows a possible lack of regulatory requirements based around the prevention of failures that could occur during normal operating conditions such what happened at Oroville Dam. These incidents are important as well, as even though no lives were lost as a result of the incident, its consequences on the local environment, economy, and communities will be felt in the years to come. In the end, while it takes a great amount of knowledge, research, and responsibility to build a large dam, it takes much more to consistently operate one and protect it from damage. It is a thankless task, as when maintenance is done right, nothing happens. Yet someone has to do it. 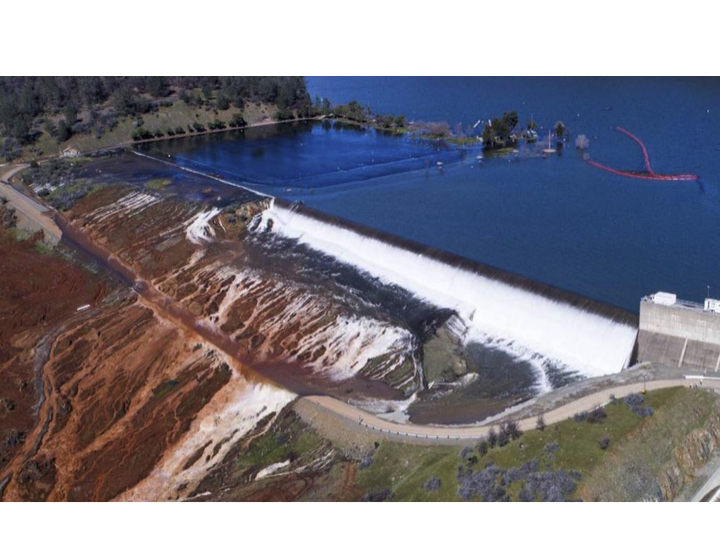 This article is based on my diploma thesis The Oroville Dam 2017 Spillway Incident – Possible Causes and Solutions, School of Civil Engineering, National Technical University of Athens, Greece. I would like to thank Prof. Demetris Koutsoyiannis for supervising my diploma thesis and for his constant willingness to assist me whenever I had any questions. I must also express my gratitude to ITIA research team members Panayiotis Dimitriadis and Theano (Any) Iliopoulou for providing critical advice related to flood frequency analysis methods, and to Prof. Panos Papanicolaou for his assistance with the spillway chute water surface profile model. Finally, I must also thank David Hagen for his excellent article Will the Oroville Dam survive the ARkStorm?, which provided crucial information for this study, as well as Judith Curry for hosting it on Climate Etc., and for expressing her own interest in my thesis. Moderation note: As with all guest posts please keep your comments civil and relevant. This entry was posted in Adaptation, Extreme events. Bookmark the permalink. 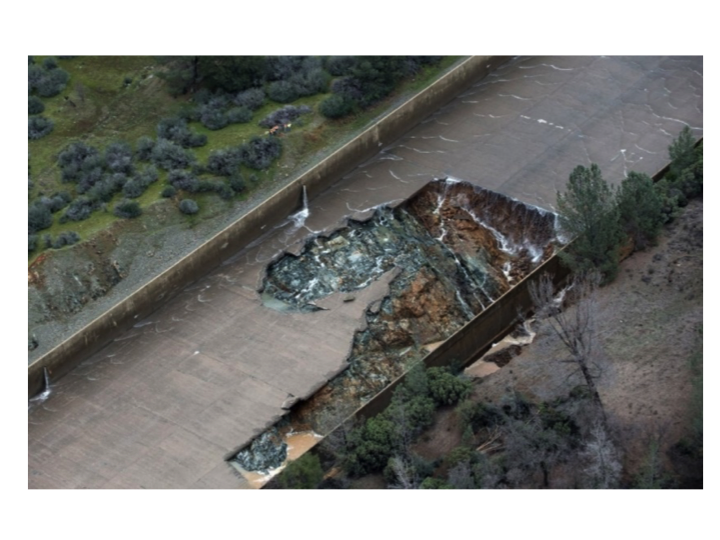 “even when a critical, yet aging structure like Oroville Dam seems to operate up to standard, one small flaw can emerge at any time and result in a severe failure.” It is nice to know that there is still some common sense, even in California. Putting the government in charge of building dams and spillways is a political solution to an engineering problem, hence a recipe for screw-ups, if not disasters. Well it may be in America, but the principle of government is that it represents all people and acts for all people. A private corporation acts for shareholders and shareholders alone. So you should ask if the appropriate shareholders for Oroville dam maintenance should be the folks living downstream of the dam, those who would die if the dam failed? Darned inconvenient it would be for faceless Wall Street investors. Life ending it would be for local communities. Who has more motivation to see things done safely, in a timely manner, safeguarding communities? That’s clearly false, as the damage are being repaid now — albeit at considerable cost. I called the damages “irreparable” because the lower half of the spillway chute essentially had to be completely replaced with a new structure. But perhaps “substantial” would be a more fitting term. This clears up some things. From watching the news, it seemed the main spillway would erode back into the dam and cause it’s substantial failure. Your second picture makes that seem not likely. The weir looks more vulnerable with its steep drop to its base. With substantial amounts of money, the weir could be flattened and given its own spillway thus protecting the main spillway. While it is a step in the right direction, I am not conviced it will be able to handle a design flood without significant erosions ocurring downstream. Unfortunately, that graphic is not to scale. The splash pad and hillside armouring will extend the full 700+ feet from the ogee weir (which will be buttressed) to the retaining wall (aka ‘secant cutoff wall’). Hardly small. You are right, of course, that the upgrades will not prevent significant erosion downstream of the retaining wall if it becomes necessary to use the emergency spillway – but that isn’t the purpose of the upgrades. They are being put into place to prevent the failure of the ogee weir. Also (for Ragnaar), the main dam itself was never in danger of failing, regardless of the breathless doom-predicting of the media. It is separated from the spillway structures by a hill of bedrock. Take a closer look at Robert Bea’s report page 14-16 addressing the “seepage” through the dam. This suggest major unaddressed problems within the dam itself that have not been dealt with. Those have the potential for catastrophic failure of the main dam if not addressed. Report 2: Oroville Dam Breach? 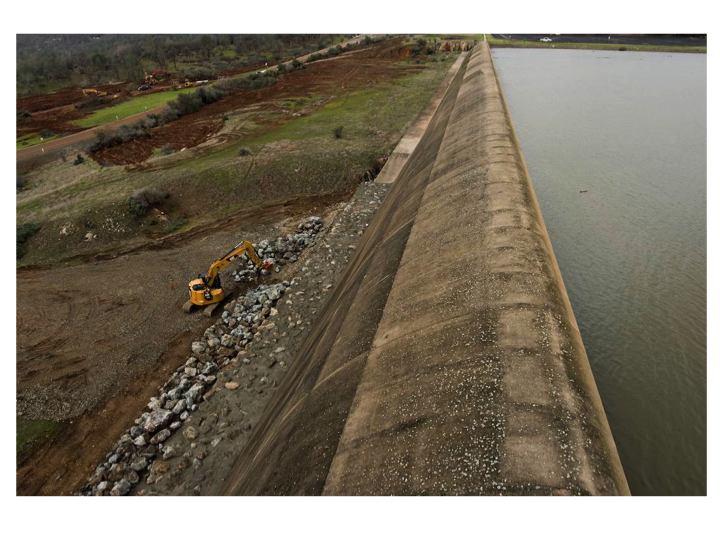 DWR Investigating Leaking – Hasn’t Revealed This to the Public – Oroville Dam may be exhibiting a dangerous failure mode from an effect known as “Differential Settlement”. This phenomenon occurs by sections of the dam “compacting” at a different rate. Thus, internal forces are applied to the center of the dam that has known to cause loss of the integrity of the core, cracking of the core, clogging of the internal drainage system, and longitudinal cracking along the interface between embankment zone fill materials. Historic failures of “Differential Settlement” at dams has found a critical component that risks the danger from the dam having an abutment with a “sharp abutment” slope change. 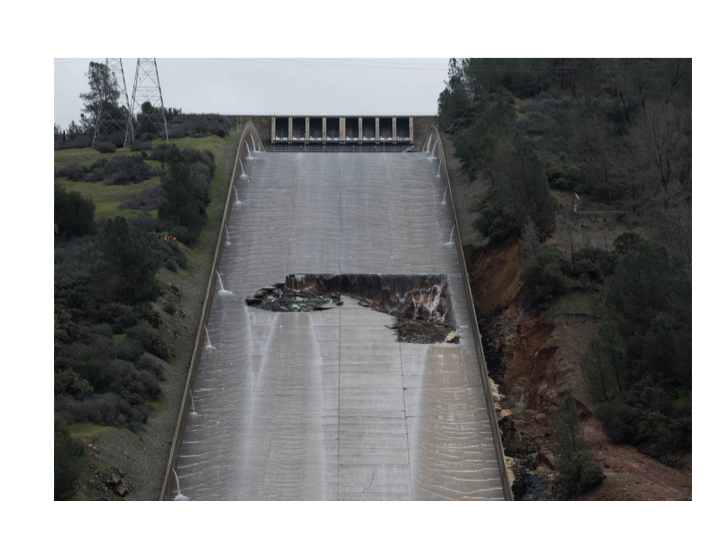 A first sign of this alarming problem would be unexplained seepage, wet spots, or greening areas on the back side of the dam (to which Oroville Dam is exhibiting). . . .
Report 4: Oroville Dam Leak? With All Internal Dam Water Sensors Broken? No Breach Warning? An earthquake induced leak or if an internal erosion defect develops, deep within the earthen fill zones at Oroville dam, DWR would have no warning, nor the ability to do an immediate slope stability assessment, as the numerous dam’s internal Piezometers are non-functional or dead. David L. Hagen – To be clear, my statement was in regard to this spillway emergency. I stand by that – it would not have been possible for the main dam to fail as a result of spillway failures. Robert Bea’s discussion of the Green Spot, it’s possible causes and the possibility of dam failure from it is another matter entirely. I think he’s over the top on this, bordering on conspiracist, but any seepage is something that needs monitoring – which DWR is doing, and has been doing for 50 years. The DWR report on this subject seems fairly conclusive to me. Thanks for the link to that recent DWR report on teh seepage- published in 2017 after Bea’s detailed January analysis. That all sounds wornderful – if it is true. And if the dam can survive earthquakes without damage to the clay barrier. However, Bea notes most of the piezometers had failed. The DWR would be much more believable if they replaced and upgraded the piezo water pressure monitoring system. I see no reason to disbelieve the report. It seems reasonable in its outline of the issue, its reasoning and its conclusion. Again, I’ll agree that more monitoring is always good, so replacement of the failed piezometers would be nice. That being said, though, contra Dr. Bea they do have a seepage monitoring system. It is not as location-specific as the piezometers, but it works for the purpose. As for earthquakes, that’s yet another side issue to the spillway failures. The only things I can say are: that the dam was designed (to the best of 1960’s knowledge) with earthquakes in mind; and that the dam has already come through one (magnitude 5.7, in 1975) with no damage to any of the main structures of the complex. PMP estimates are required for the PMF and PMPDF calculations and are thus determined on a specific catchment basis. The process of estimating PMP for any catchment is to begin with the convergence components of the PMP storm derived from the set of design curves constructed in Section 3.6 and then adjust that storm by reconstructing the site specific features of that catchment. The difference between practical and theoretical hydrology. The generalized method of ‘operational’ PMP estimation is global – used by the WMO as well as Australia and the US. There has been much discussion of the Annual Exceedance Probability of the PMP design storm but it is generally considered to be less than 0.01% as a working estimate. PMP are routed through the catchment using flood routing software. 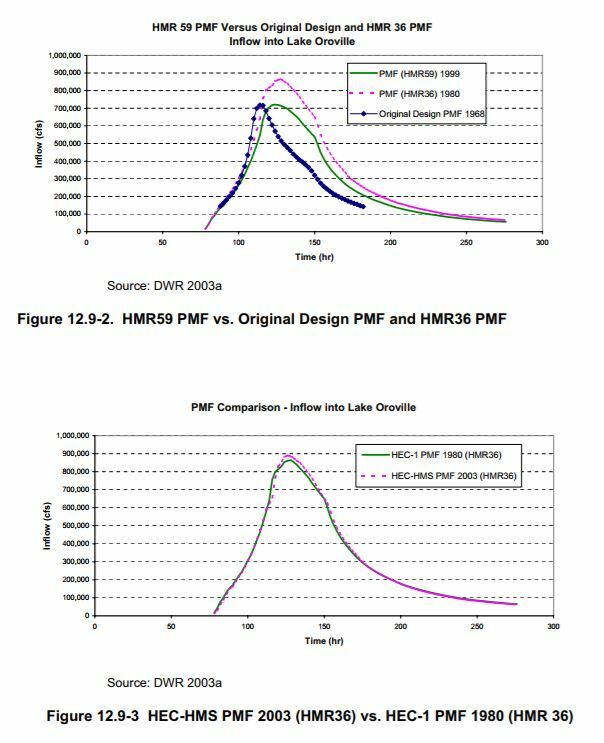 Below are the PMF design inflow and outflow hydrographs for Oroville. It is mandated that spillways for major dams be designed to the PMF outflow – in this case 725,000 cfs. Design outflows are governed by the first order differential equation of water storage. The difference between inflow and outflow is known as flood attenuation. Where S is the storage volume. Where inflow is greater than outflow – water level in the dam rises. The management of water storage is built into operational guidelines to limit risk to the dam. The bottom line is that the spillway failed at considerably less than the design PMF outflow. This makes it very clearly an engineering failure rather than one of hydrological methodology. The reconstructed spillway – and the dam itself – is quite likely to be able to withstand the 0.1% AEP of the ARKstorm. Properly designed and constructed embankment dams can remain serviceable for centuries. LPIII for 0.01% AEP events may not be as reliable as other distributions. The design PMF inflow for Oroville Dam is about 900,000 cfs. The design outflow is some 725,000 cfs. Models give a false impression of precision that must always be remembered. You couldn’t have a better supervisor – btw – than Demetris Koutsoyiannis. Thank you for the detailed response. Oroville Dam is currently operating with the HMR 59 PMF inflow of 725,000 cfs, while the HMR 36 inflow of 900,000 cfs is within the 10,000 year GEV fit. Switching to the latter flood for design purposes could also be adequate. The LP3 fit is included in this study because it is widely known. If someone were to ask me which curve I “trust” more, I would say GEV. However, as you said, blindly trusting models is dangerous. As seen in that figure, the maximum discharge without significant overtopping occurring until now was 292,000 cfs. However, the chute walls of the new main spillway will be raised to practically accommodate a 308,000 cfs inflow. The worrying aspect of this situation, however, is not the main spillway chute, that has been designed with the care it deserves. The problem, in my opinion, is a practical one. In every design flood scenario, the emergency spillway is expected to withstand much larger outflows than the main chute, and until now it was simply a lone ungated ogee weir. There is a video apparently of the 97 flood (from memory) which shows water levels almost at the top of the chute walls. The design team are apparently raising the chute walls. LPIII uses regional skew coefficients – developed by professional bodies the world over. I assume the GEV requires a regional adjustment as well. At this stage a professionals only option is the generalized method of ‘operational’ PMP estimation. I would – btw – consider all the results you cite equal within the limits of estimation uncertainty. But would use the generalized method. In a catastrophic flood most of the flow would be over the auxiliary spillway. Not sure what the problem is. Robert I Ellison: . But would use the generalized method. In this context, what is “generalized method”? Is that the GEV distribution? Your interchange with Telis Koskinas is interesting. The above paper mentions rainfall, not streamflow, but the concepts of extreme value theory and statistics can be applied to both. I did provide a link and a fuller description. Spatial and temporal patterns are needed for flood routing. The Fréchet law has a fat power law tail – and we may conjecture on the suitability of power laws for chaotic systems. In the latter there are extreme events that are outliers. However, as a matter of practical hydrology the generalized method of PMP estimation is the engineering standard. In California with HMR59. Robert I Ellison: I did provide a link and a fuller description. Spatial and temporal patterns are needed for flood routing. Indeed you did. It’s a good paper. Thank you. I am glad to read that you in fact do support the statistical modeling of extremes. Hydrology is more probability than statistics and the general method of PMP estimation is neither. And for the last time Hurst effects are not the statistics of extremes. This is a better summary in a May 2017 document. The plate slabs of the lower section of the principal spillway of the Oroville Dam are cracked with a spiderweb of small cracking or “crazing”. This work was just completed at a cost nearing $ 500,000,000. after the catastrophic failure of the spillway sluice last year. The work done is sub-standard and constitutes a maintenance and repair issue, and the more critical upper spillway and gate structure are incomplete. To say that I am disappointed is an understatement. It is one thing to fail completely at your charge. It is another to learn nothing from your failures. David L. Hagen: Complements on your clear extensive presentation. thank you as well to you and Telis Koskinas for a good interchange. Thank you for your kind words. The reports you link contain several photos of the main flood control outlet and spillway chute I had not seen before. The picture showing the “patched cracks” is particularly interesting, as it confirms that there is a direct link between these cracks and 2009 and 2013 chute repairs. The telltale signs of failure were already there, but at the time must have been interpreted as not dangerous enough to warrant an extensive reconstruction. For a more general-use structure, hairline cracks in the concrete might have been acceptable, but for a spillway chute that must remain waterproof, this is definitely worrying. I agree with Scott Cahill’s stance on the issue. Professor Bea has over 48 years of experience in engineering and management of design, construction, maintenance, operation, and decommissioning marine systems including offshore platforms, pipelines, and floating facilities. Does this have anything to do with anything? The ARKstorm is nominally a 1000 year event. And is he a hydrologist? If Robert Bea has said anything relevant to say – please share. The spillway failed at very much lower flows. The new spillway is very unlikely to. 5. Spillway base slabs designed with ineffective ‘ground’ anchors to prevent significant lateral and vertical movements. 2. Failure to prevent spreading gravel used as part of the under-slab drainage systems and ‘native’ soils to form extensive ‘graded blankets’ of permeable materials in which water could collect and erode. 4. Allowing large trees and other vigorous vegetation to grow adjacent to the spillway walls whose roots could intrude below the base slabs and into the subgrade drainage pipes resulting in reduced flow and plugging of the drainage pipes. See: Porter, K. Et al. (2011) Overview of the ARkStorm Scenario: U.S. Geological Survey Open-File Report 2010-1312, 183 p, and appendixes. The Oroville Dam failure is symptomatic of California’s very poor design, maintenance and operational preparedness for the likely coming megastorm due to Atmospheric Rivers with a similar frequency to the next “Big One” earthquake, but costing three times more. The link was to a biosketch – and I searched your post for any mention of Robert Bea. So left in the dark as to what your intention with this was – I asked the question. There were obviously engineering problems with the chute as it failed at a relatively low flow. Indeed lower than in other relatively recent floods. From memory you waffled on in your post about hydrologists ignoring Hurst effects in estimating extreme floods – and that’s pretty funny. The ARkStorm is a very different idea. It addresses the potential for wide scale flooding over much of California – that you unreasonably conflate with extreme and unheralded flow at the Oroville Dam catchment level. In the spatial distribution of precipitation within the ARkStorm there are areas with more or less intense rainfall. Where this occurs is unpredictable enough to be called random. The ARkStoprm as I have said is nominally a 0.1% AEP storm. A properly designed, constructed and maintained dam will survive a 0.1% AEP storm. You are peddling naive and unjustified ideas to the detriment of rational planning. Where there are engineering failures – professionals are responsible and must be held to account. But hydrological design at Oroville Dam has not failed. The very name “ARkStorm (“Atmospheric River 1000 [year] Storm”) incorporates atmospheric rivers. NASA explicitly implicated an Atmospheric River as the cause of the high rainfall and water flow into the Oroville dam. California has been hit by multiple atmospheric river events over the 2016-2017 winter season. Atmospheric rivers are long, narrow bands of high water vapor that transport moisture from tropical regions into the mid-latitudes. The atmospheric rivers bring 50% or more of the annual precipitation to California and often lead to hazards, such as flooding and mudslides. The events of January and February 2017 resulted in year-to-date precipitation totals greater than 150 – 200% above normal for many Northern California locations. . . .Reservoirs, which supply essential water during the dry-season, have filled to capacity due to the excess rain. Lake Oroville, in Northern California, experienced weeks of heavy rain and runoff into the reservoir. NOAA similarly relates atmospheric rivers (AR) with the Oroville dam. by mid-February this year, northern California had already been impacted by 21 separate AR events, going back to October. After six years of drought, California was deluged in 2017 by sequential “atmospheric rivers” causing the highest January/February rainfall on recent record. California’s Oroville Dam experienced failures of both its primary and emergency spillways. Yet the main spillway failed at 50,000 cfs. The emergency spillway failed at just 15,000 cfs! Together they failed at 5.7% of the 1,129,000 cfs flow your 10,000 year flood estimate. Thus, I hold that the actual dam design, maintenance and operation of the Oroville dam have failed. That is symptomatic of inadequate design, maintenance and operation of dams across California that are subject to atmospheric river flooding. PS I had a course in hydrology and dams at St. Anthony Falls lab, U. Minnesota. …what does one do when a spillway, a structure built to deal for emergency situations, fails just when it is needed? …is the auxiliary spillway a feature, or a mark of a critical flaw in its design? While it would indeed save the main dam from overtopping… [by] flooding an enormous area with more than 180,000 permanent residents. Sort of like the failure or the government education complex– it failed society just when it was most needed — the promise of universal education has produced a bitter fruit — and, we’ll be living with that failure for generations. Spillway collapsed due to leakage and erosion. Was it water going out or not coming in that caused the structural collapse? Was the concrete lifted or sunk? Now with roller concrete the voids have been sealed-is it enough? – The IFT believes that the service spillway chute failure most likely initiated by the uplift and removal of a section of the slab in the chute downstream of Station 33+50 at shortly after 10:00 am on February 7. Once the initial section of the chute slab was removed, the underlying moderately to highly weathered rock and soil-like material beneath the slab in this location was directly exposed to high-velocity spillway flow. The high-velocity flow rapidly eroded the foundation materials at this location, removed additional chute slab sections in both upstream and downstream directions, and quickly created the erosion hole that was observed by 12:30 pm on February 7, as flows diminished following spillway gate closure – see photo below. These findings are based on eyewitness accounts, and photo and video records. The excessive uplift pressure was mainly due to high-velocity spillway flow injecting water into slab surface features, such as open joints, unsealed cracks over the herringbone drains, spalled concrete at either a joint or drain location in either a new or previously repaired area, or some combination of these features. Note Bea’s report page 14-16 addressing the “seepage” through the dam. This suggest major unaddressed problems within the dam itself that have not been dealt with. Poor maintenance by the DWR resulted in most of the water pressure instruments (piezometers) failing so the high water pressure causing seepage within the dam has NOT been monitored. Excellent article. The one small flaw observation: critical component issue. Impossible to be completely covered. Learn from errors, unfortunately. Nature showed what constitutes quality rock. Hope that portion ends in geoengineering classes. Quality articles like this is why I pass this site daily! Nice summary. My suspicions at the time were poor design, poor maintenance, and poor inspection. Your thesis confirms those suspicions. Worrisome to wonder how many other major infrastructures suffer from similar problems. The American Society of Civil Engineers (ASCE) warned in 2013 that California has a $65 billion infrastructure investment deficit in providing an adequate level of public infrastructure for dams, waterways, airports, roads, bridges, seaports and tunnels. . . .
ASCE also warned that to prevent major flooding from storms, California would need to invest “$2.8 billion per year for the next 10 years” to bring its channels, levees, dams and pumping stations up to proper condition to protect thousands of homes, businesses and critical community infrastructure. Should’ve let highway engineers design the spillway. They know how to build concrete structures that won’t wash out or collapse. locations and more flow into the foundation than during the prior spillway discharge events. • Possible expansion of relatively shallow void(s) under the slab due to long-term erosion under the slab. Long term deterioration of engineered infrastructure is a fact of life. When the deterioration of components threatens the integrity of the structure is a much more difficult question. That failure of the chute occurred and the dam survived seems more an engineering success – where people live to pontificate about it – than an engineering failure. 200% in an Atmospheric River flow causes 450% probability of 50mm/d river runoff. A Nov 2017 report of highly nonlinear rapid increase in flood probability for increases in atmospheric floods hitting California. This is critically important on sizing emergency spillways and dam levels to prevent cascading failures to the Oroville Dam etc. Compare the 62 dam cascading failure in the Banquoi Dam incident in China! C. P., Konrad & Dettinger, M. D. (2017) Flood runoff in relation to water vapor transport by atmospheric rivers over the western United States, 1949–2015. Abstract Atmospheric rivers (ARs) have a significant role in generating floods across the western United States. We analyze daily streamflow for water years 1949 to 2015 from 5,477 gages in relation to water vapor transport by ARs using a 6 h chronology resolved to 2.5° latitude and longitude. The probability that an AR will generate 50 mm/d of runoff in a river on the Pacific Coast increases from 12% when daily mean water vapor transport, DVT, is greater than 300 kg/m/s to 54% when DVT > 600 kg/m/s. Extreme runoff, represented by the 99th quantile of daily values, doubles from 80 mm/d at DVT = 300 kg/m/s to 160 mm/d at DVT = 500 kg/m/s. Forecasts and predictions of water vapor transport by atmospheric rivers can support flood risk assessment and estimates of future flood frequencies and magnitude in the western United States. we never would of guessed that. With dire warnings about cascading failures from some undefined flooding. Horrors. Just a clue – the k in ARkStorm refers a 1000 year AEP. That would be a 0.1% chance of the flow being exceeded in any year. A 1 in a 1000 chance. Every year.